I love clams. My family does not. My kids mistrust small chewy dark things, and my wife is generally squeamish about bivalves. I would steam them with wine and olive oil and herbs and eat them with some crusty bread. But if I want everyone in the house to enjoy them, I make clam chowder. The family gets a lovely clam flavor-infused soup, and I get all the clams. Peel two potatoes and cut into 1/2 inch cubes. Render bacon in a large saucepan over medium heatuntil crisp, and remove. Cook onions in rendered bacon fat until soft, and add potatoes. Cook for five minutes, stirring occasionally. Add stock and cook 30 minutes. Turn off heat and let cool. When soup has cooled, puree in a blender until smooth. Return to saucepan and add last potato, unpeeled and cut into 1/2 inch cubes. Heat over medium until soup begins to simmer. Add clams and cream, cover and turn off heat. Clams will open within 10 minutes. Season to taste with salt and pepper. To serve, either remove clam meat from shells and discard shells. 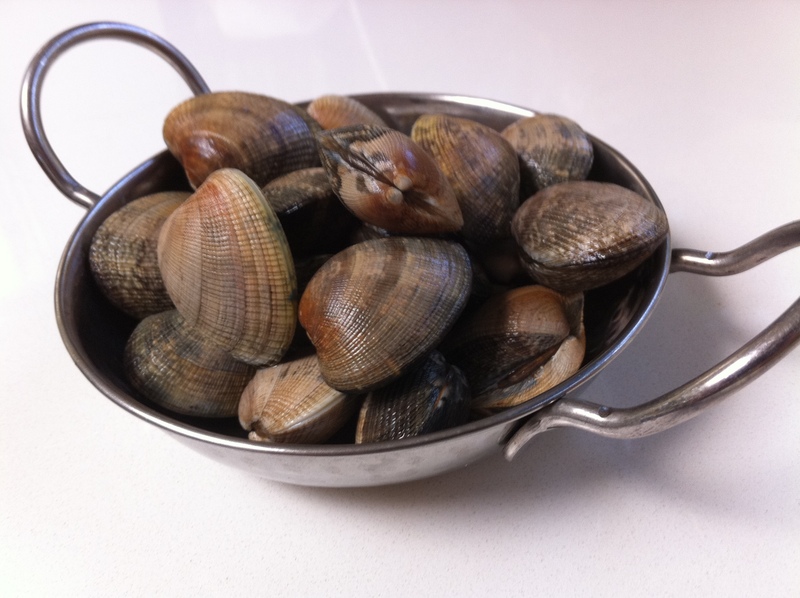 Or serve clams in their shells in the soup, if you think your guests would like scooping clams from their shells. How could something so wrong feel so right?